The American Museum of Natural History is one of New York City's most beloved institutions, and one of the largest, most celebrated museums in the world. Since 1869, generations of New Yorkers and tourists of all ages have been educated and entertained here. Located across from Central Park, the sprawling structure, spanning four city blocks, is a fascinating conglomeration of many buildings of diverse architectural styles built over a period of 150 years. The first book to tell the history of the museum from the point of view of these buildings, including the planned Gilder Center, The American Museum of Natural History and How It Got That Way contextualizes them within New York and American history and the history of science. Part II, "The Heavens in the Attic," is the first detailed history of the Hayden Planetarium, from the museum's earliest astronomy exhibits, to Clyde Fisher and the original planetarium, to Neil deGrasse Tyson and the Rose Center for Earth and Space, and it features a photographic tour through the original Hayden Planetarium. Author Colin Davey spent much of his childhood literally and figuratively lost in the museum's labyrinthine hallways. The museum grew in fits and starts according to the vicissitudes of backroom deals, personal agendas, two world wars, the Great Depression, and the Cold War. Chronicling its evolution-from the selection of a desolate, rocky, hilly, swampy site, known as Manhattan Square to the present day-the book includes some of the most important and colorful characters in the city's history, including the notoriously corrupt and powerful "Boss" Tweed, "Father of New York City" Andrew Haswell Green, and twentieth-century powerbroker and master builder Robert Moses; museum presidents Morris K. Jesup, Henry Fairfield Osborn, and Ellen Futter; and American presidents, polar and African explorers, dinosaur hunters, and German rocket scientists. 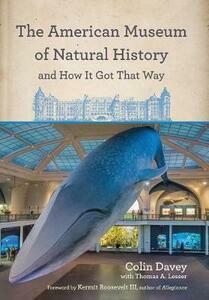 Richly illustrated with period photos, The American Museum of Natural History and How It Got That Way is based on deep archival research and interviews.